This preview claims to be a complete game, so i’m not sure why this game never found a publisher. A shame, as its a nice little puzzle game featuring some nice polished graphics by Samar Productions, and many levels to boot too. Featuring a creature you must simply get to the end, each level pocesses a new challenge. 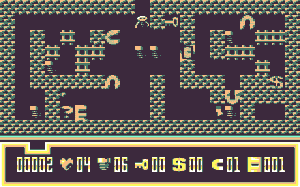 Although most of the levels look the same in their style of character block, the levels are well though out, and offer a harder challenge as you progress. Music is also quite good, and other presentation is adequte for the game. Just why it was never released anywhere is anyone’s guess. Maybe you know why?… It’s simply a case for this game to find out why it wasn’t released to give a better background to it for the archives. Can you help?